David Minelli taught in the Shoreham-Wading River School District for 27 years. 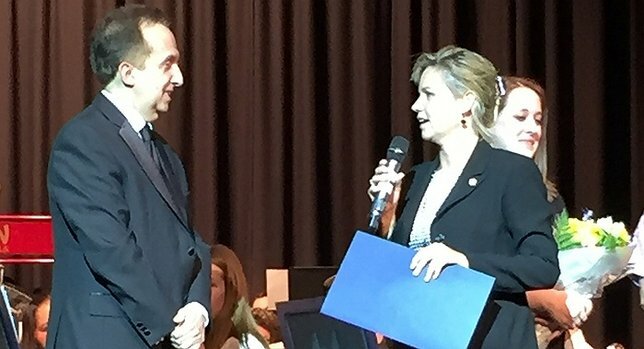 Suffolk County Legislator Sarah Anker (right) congratulates David Minelli (left) on his last concert as the Shoreham-Wading River High School band teacher. Shoreham, NY - June 4, 2018 - On Wednesday, May 23, 2018, Suffolk County Legislator Sarah Anker honored David Minelli, the Shoreham-Wading River band teacher for 27 years, with a proclamation to celebrate his extraordinary service to his students and the district. Legislator Anker was joined by Shoreham-Wading River High School administration, faculty, current students, and alumni in celebrating David Minelli’s last concert as the band teacher and to wish him well in his retirement. David Minelli taught high school concert band, jazz band, pit orchestra, and music theory in the Shoreham-Wading River School District for 27 years. Previously, he also taught at Three Village and Sachem School Districts and served on the faculties of Ithaca College, Cornell University, and New York University as a professor of clarinet and music education. As a clarinetist, Mr. Minelli has recordings on Capital and Mark records and has toured Italy, appearing on European Public Radio and Television as part of the New Music Consortium. He is a 32-year member of the New York State School Music Association (NYSSMA) and has been an active member of the Suffolk County Music Educators’ Association. Subject: LongIsland.com - Your Name sent you Article details of "Legislator Anker Honors Shoreham-Wading River Band Teacher at Last Concert"